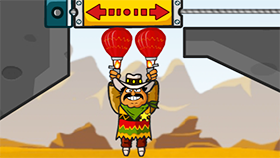 Amigo Pancho 4 is the fourth part of the puzzle game series developed by Yury Koshechkin. Still with the familiar Disney cartoon style as before, however, the plot is more interesting with three parts and our main character in this section is Pancho. In general, challenges are pushed to a very high level, after finding a way to destroy the obstacles as well as finding a safe path to escape, you have to manipulate the real time. Exactly what can be done on the road because the road safety is sometimes very narrow just enough to fly two balloons. Just a little biased will not be able to safely fly up. Each stage at the beginning will have 1000 points and this number will decrease until you complete the stage. At this point, the rest of the score is the number of points you gain from the stage. The quicker you complete the more points you get. To decode the missile launcher, please note the number of bees each.